That 4:30am wake up call came way too soon after a fitful night of sleep at Blue Duck Station. Jolted awake by the sheep bleating of M’s alarm, I groaned and rolled over, determined to stay in my warm bunk bed forever. 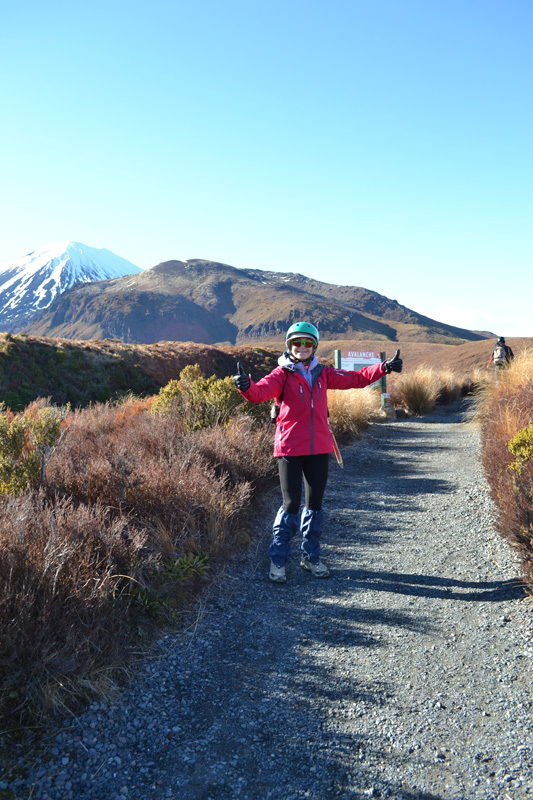 But it was time to conquer the famous Tongariro Crossing. It would take a couple hours to drive to the trail head and we needed an early start if we were to finish the 12 mile/8 hour trek before nightfall. Sounds intense right? IT WAS. 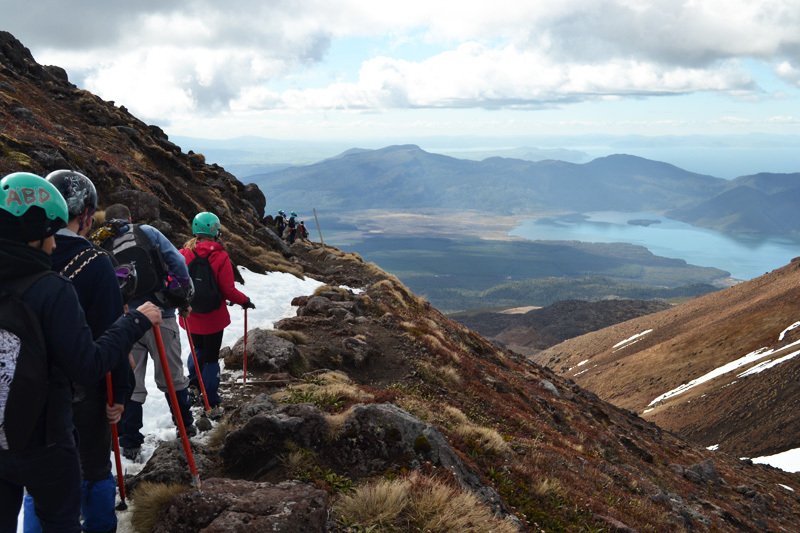 Once we arrived at Tongariro National Park, we stopped at the local gear shop to meet our guides and get outfitted for the snow and ice waiting for us on the mountain. Coffee was a must. Outfitted in a helmut, jacket, fleece, scarf, waterproof pant sleeves and long-underwear, we grabbed our ice picks and packs full of water and squeezed onto a small bus. Time to hit the trail! Squeezed together like sardines, we looked out the window at the impending mountains with nervous energy. We were about to walk 12 miles? Voluntarily? Tucking our ice picks into our packs for later, our massive group took off at the base of the trail, splitting into three groups of various speeds. Linda and I found ourselves at the back of the pack, not necessarily by choice. But slow and steady wins the race, at least that was our excuse. Within a few minutes, we found ourselves dragging at the back of the pack. Oh my god, were we going to make it? I felt as slow as molasses compared to the others who seemed to run up the mountain with ease. 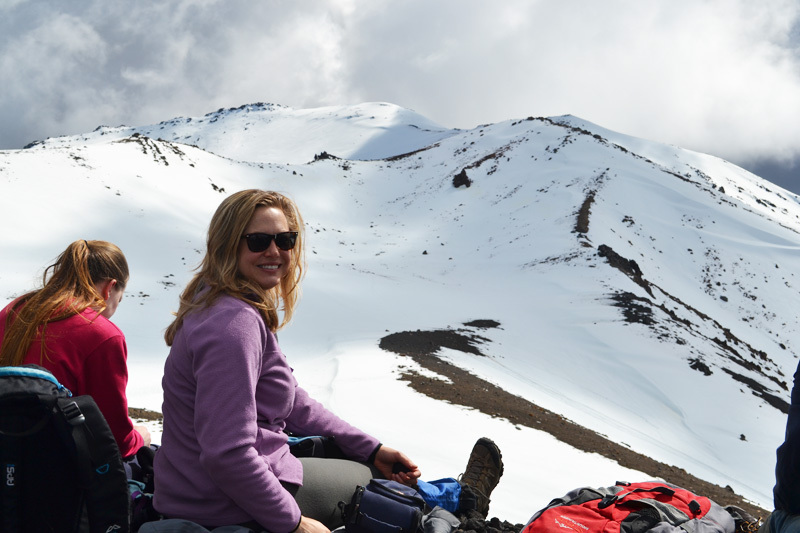 Long-term backpackers are freaks of nature! 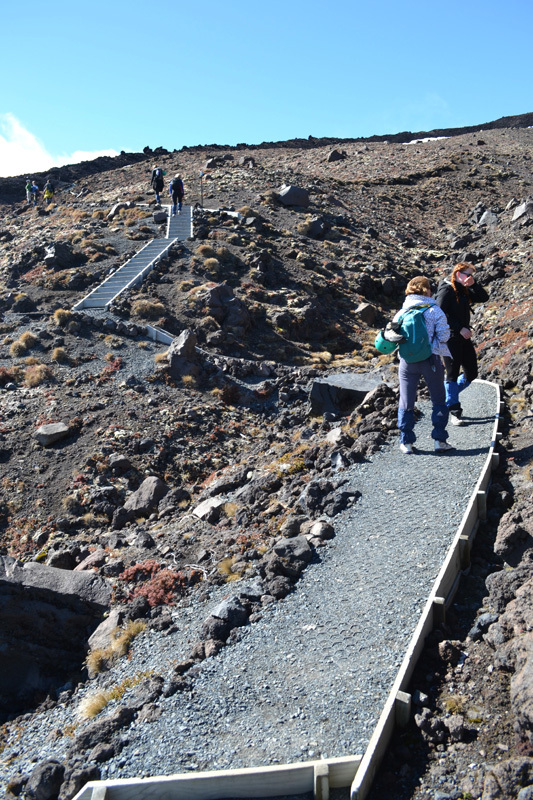 I wanted to enjoy the trek as much as possible but feared that my gawking would get me lost forever in Mordor. 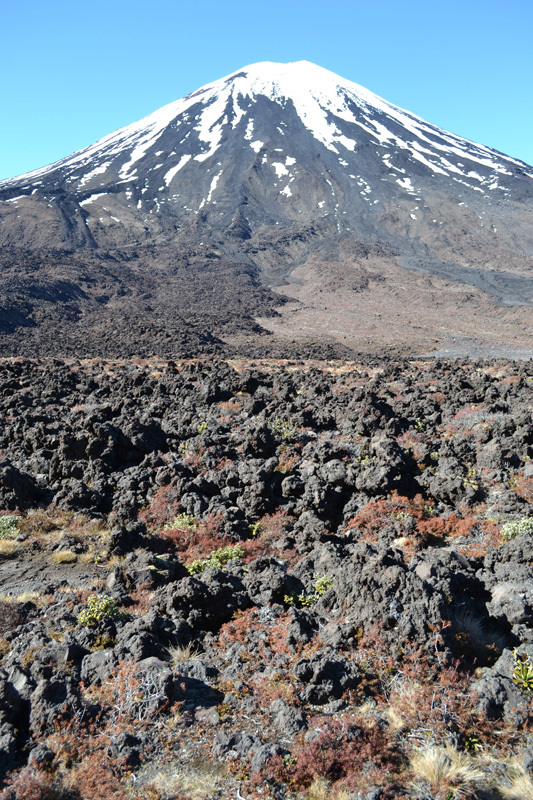 Yes, we were all at once alone in the volcanic wasteland that inspired the most sinister landscape in The Lord of the Rings. 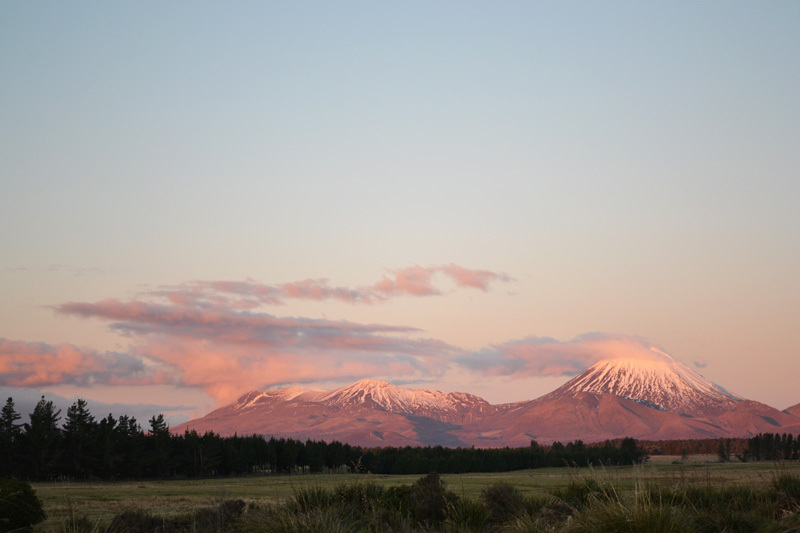 Looming in the background was Mount Ngauruhoe, which had been digitally altered to appear as Mount Doom in the movies. Comforting. 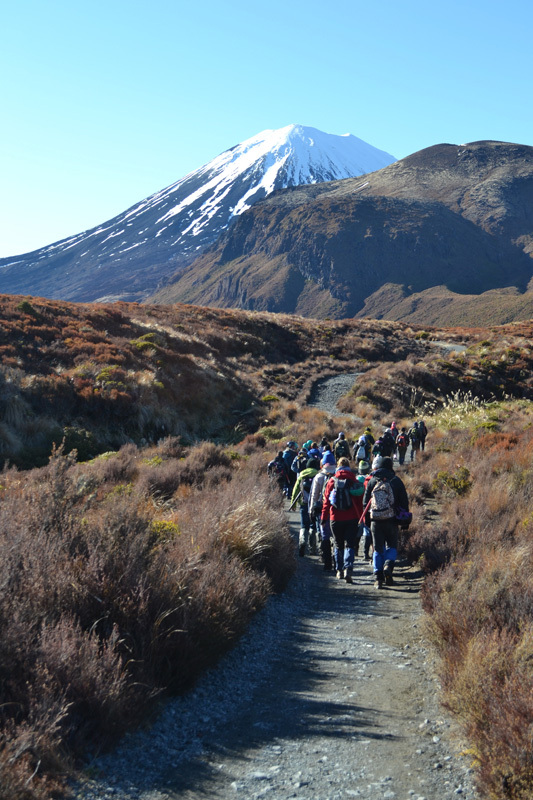 Eventually we caught up with group #3 at the back of the pack and began to climb the dreaded Devil’s Staircase. 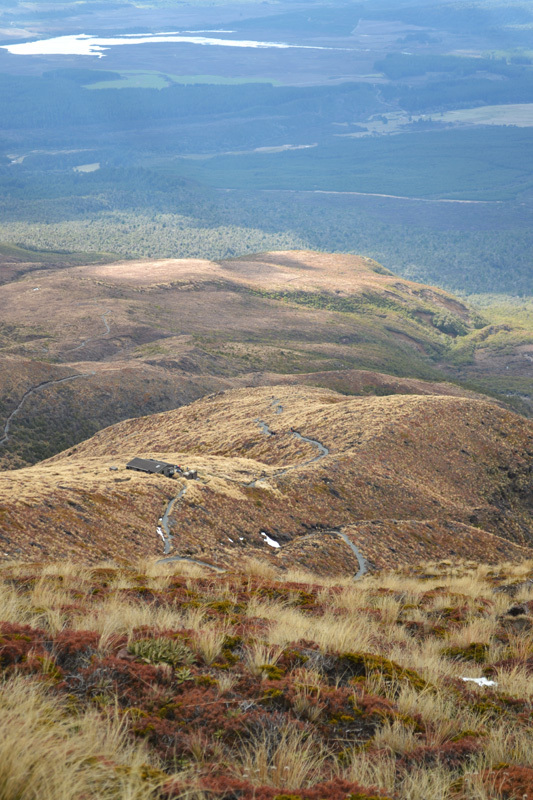 Devil’s Staircase is one of the steepest ascents of the crossing that goes from 1,400 to 1,600 meters above sea level in the span of 45 minutes. You climb up and up and there really is no time to stop for long. 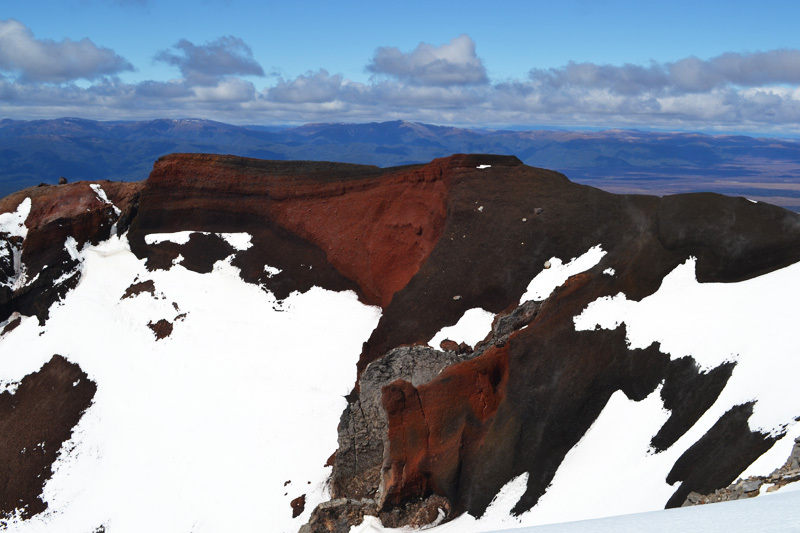 Mount Doom pales in comparison. 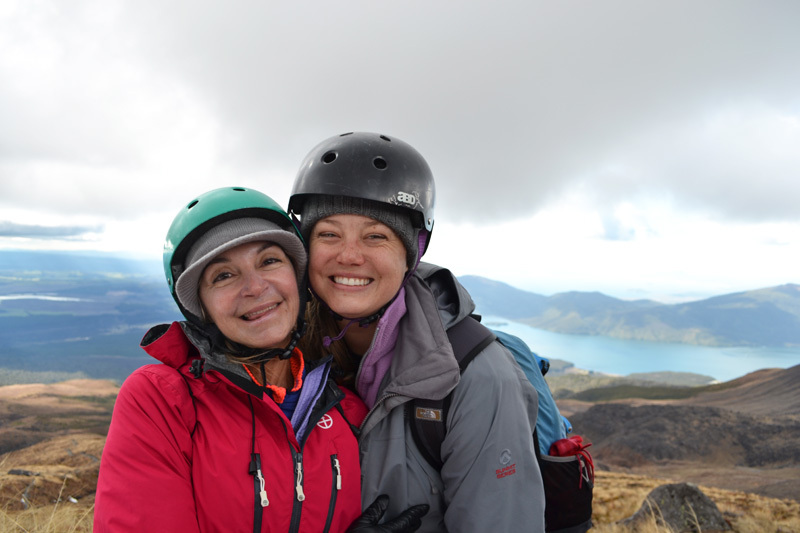 We formed a small group of climbing buddies and became each other’s biggest cheerleaders. More often than not I encouraged Linda onward because if I could focus on helping somebody else then I could distract myself from the burn in my legs and lungs, no matter how much I wanted to quit. Reaching the top of Devil’s Staircase was such an incredible relief. But things were about to get tough. 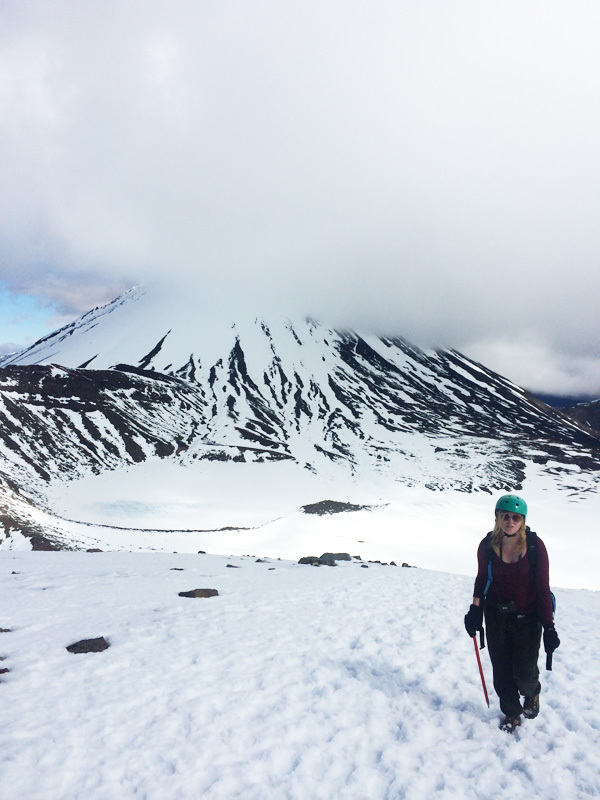 We were faced with the South Crater, a seemingly innocent stretch of level ground covered in snow on the way to the summit of Tongariro. Sounds easy right? Well this time of the year (September), the ground was covered in several inches of snow in the process of melting in the harsh sun. With each step, our feet sunk deep in the slush, encountering little streams under the surface. Collecting melting snow and ice with each step, my socks and shoes were completely soaked within minutes. 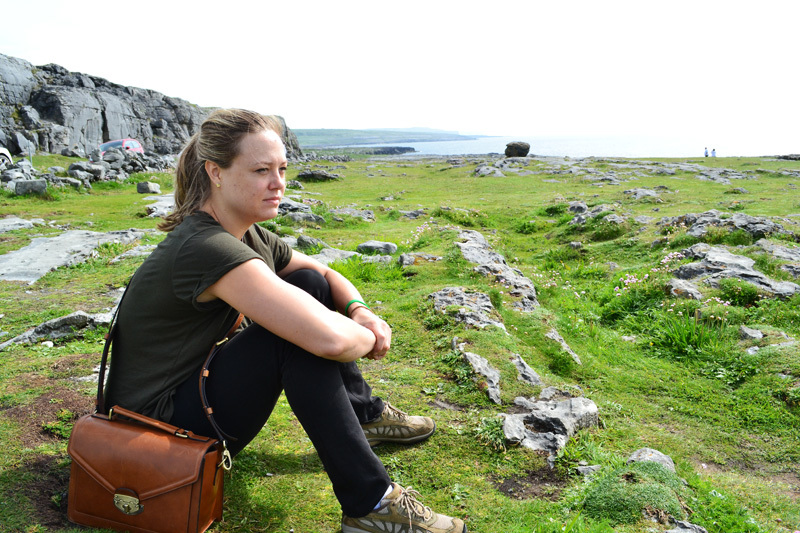 I was increasingly frustrated and distressed as my feet became cold and wet. It felt like I was making zero process and each step took a huge amount of energy. It was the first moment I thought to myself, I don’t think I can do this. By some grace, I met a guy from China and we started talking about living there and our travels. It took my mind off my miserable condition and forced me to keep a happy face. 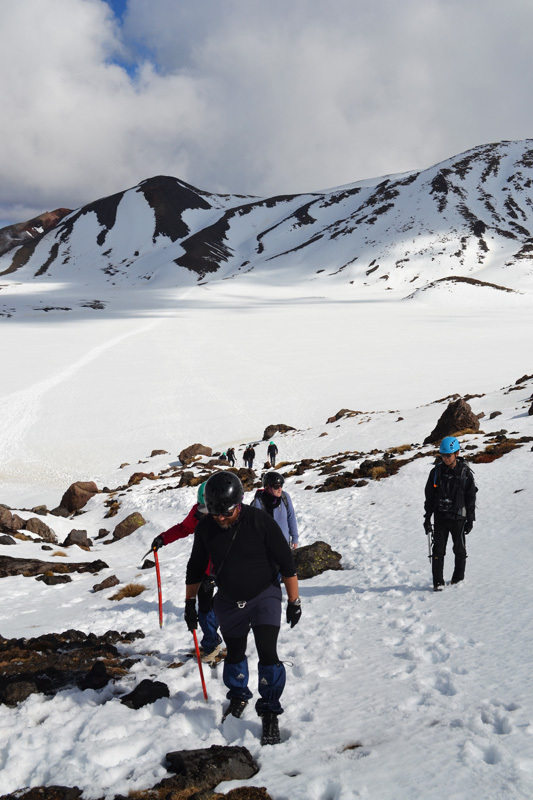 Once we were close to the hillside where the rest of our group was waiting, I took off running to get the heck off the snow-covered hell and wring out my socks. At this point I was disheartened and frustrated. But I noticed my friend Sigrid having a really hard time and tried talking to her. She started crying, saying she was so exhausted and wanted to go back. I jumped into crisis mode, asking if she had anything to eat in the last few hours, forcing her to eat something to raise her blood sugar and called over our guide asking if it was possible to turn back. 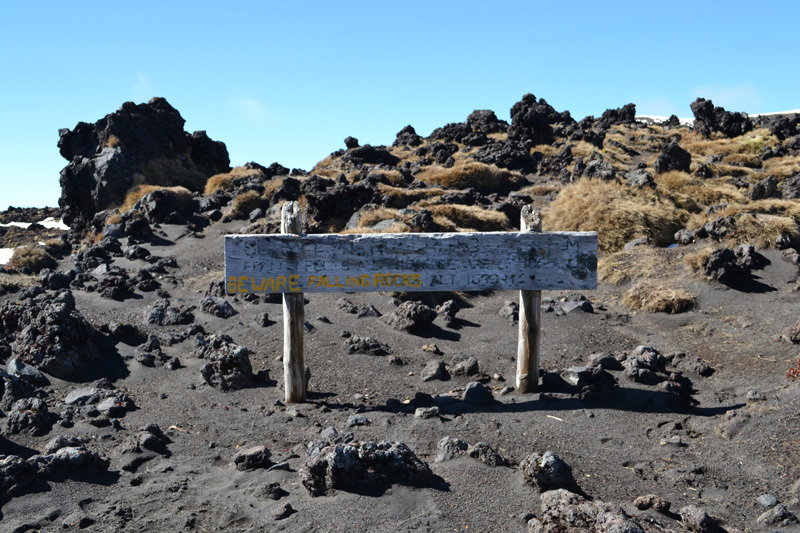 He said it was impossible, that it would be faster to finish the trek at this point. 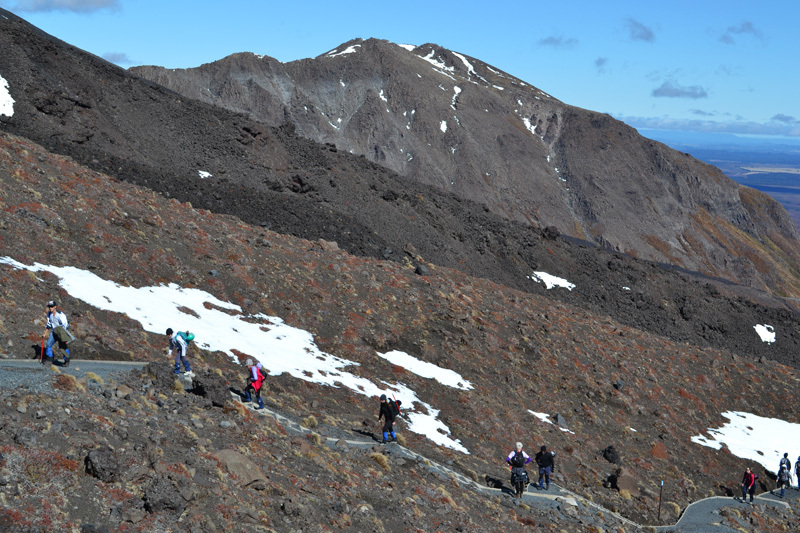 While the rest of the group stood up to complete the last difficult ascent up Tongariro, I told Sigrid to follow me closely and step exactly where I was stepping as I slowly but surely climbed the steep mountain face. Through sheer force of will, she followed me up that mountain and we joined each other in song, singing our way through our frustration. 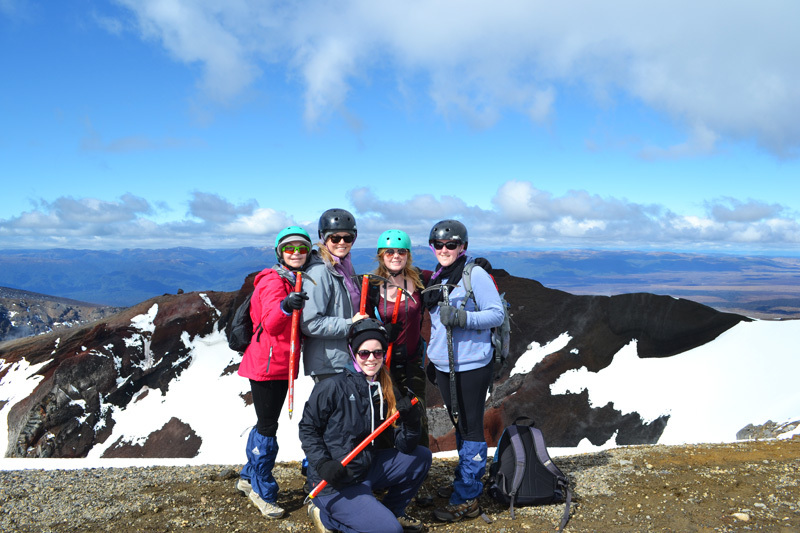 Using our ice picks to haul ourselves over the rocky terrain and humming Jason Mraz songs, we made it to the top! 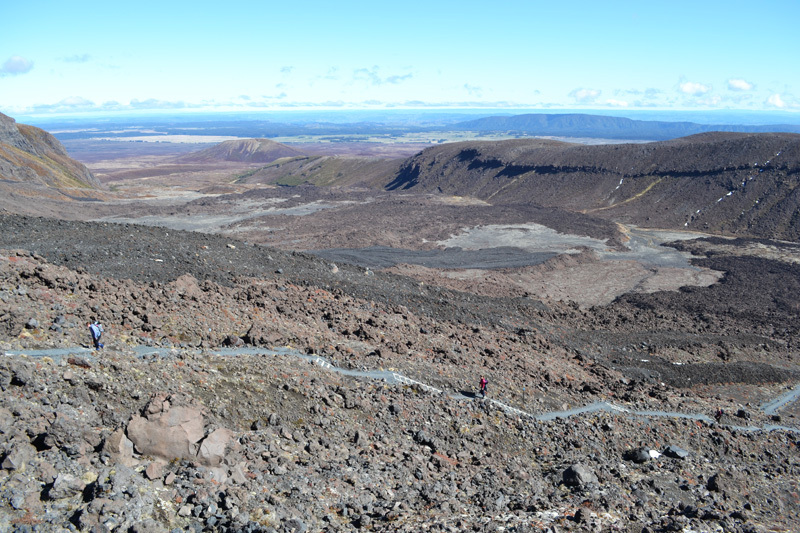 It was my most triumphant moment of the trek because Sigrid and I had done it together. 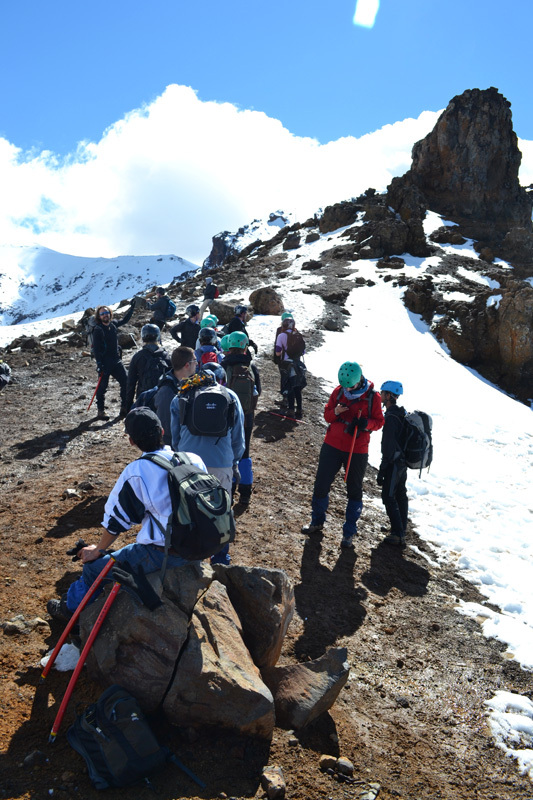 Trekking with my friends made this experience so incredible and I will never forget their perseverance and heart. 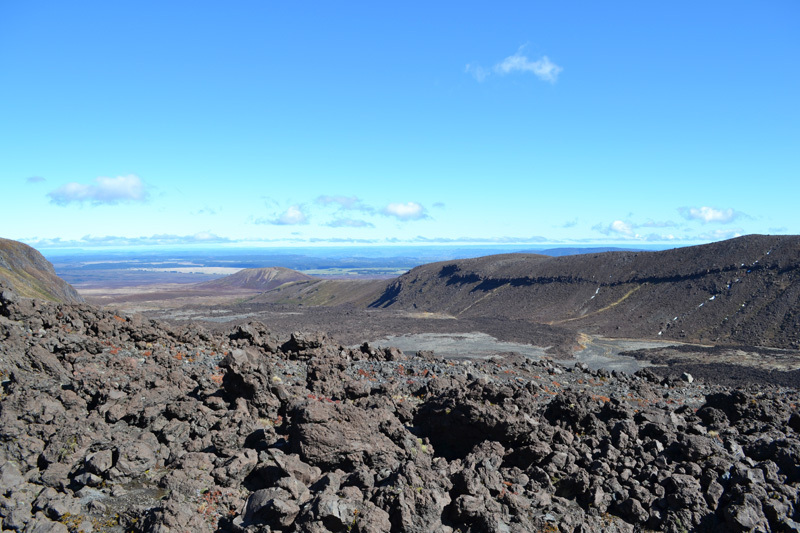 From the top of a narrow ridge, we could see the South Crater behind us and the Red Crater before us. 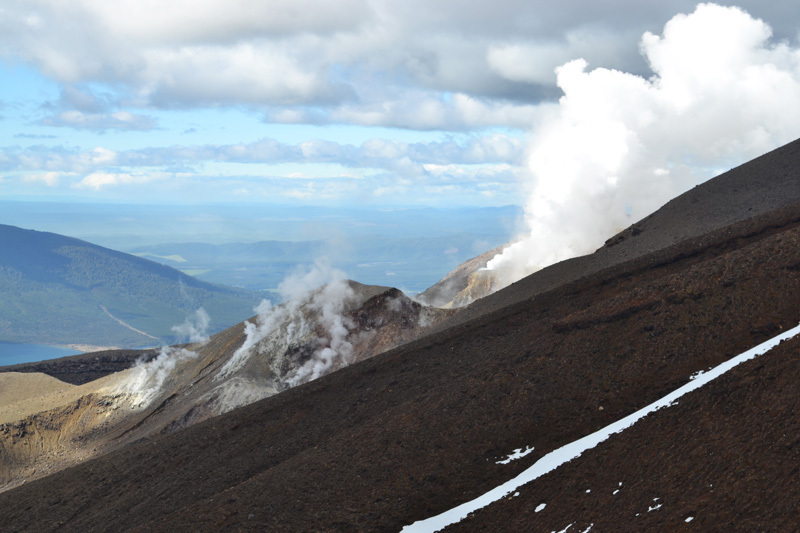 Steam was pouring out of the red tinged rock, a sign of an active volcano! 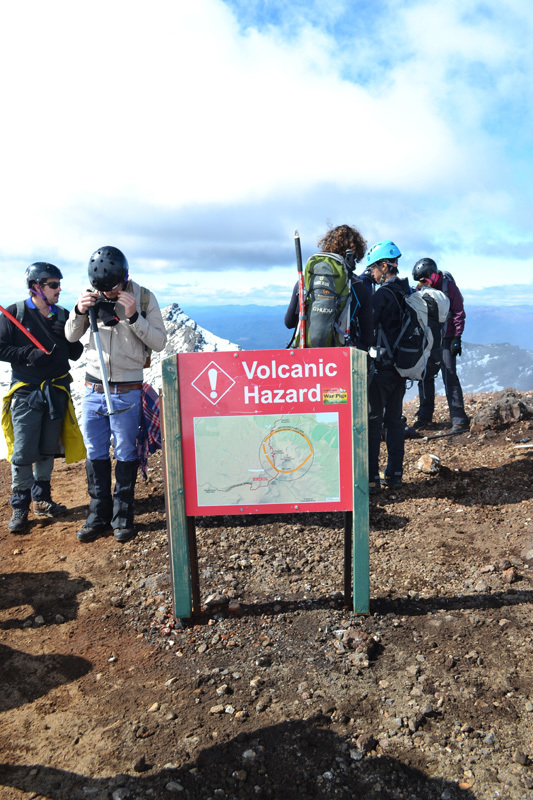 We climbed an active volcano! AH! 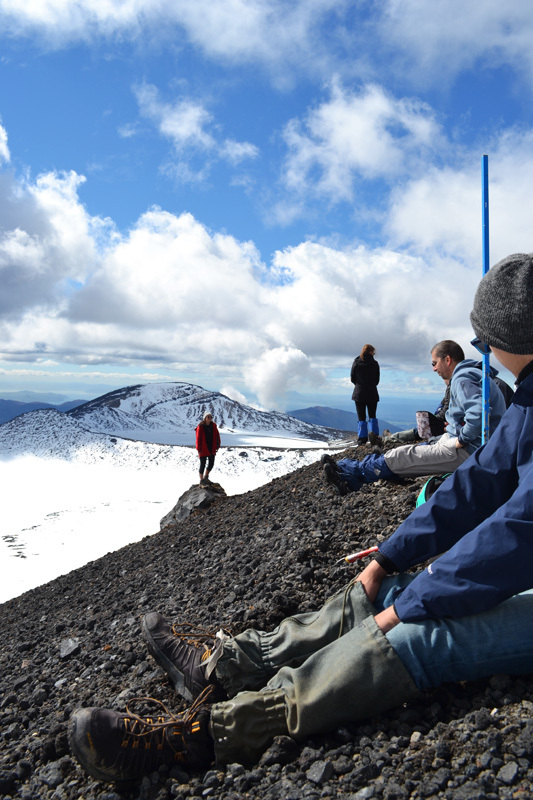 We climbed a little bit farther to reach the actual peak of Tongariro, where we sat with our legs dangling off the edge of the world to enjoy our lunch. It was a welcome rest after a tough few hours and I wanted to stay up on the top of the world in the sun all day. But the sun would set eventually and we had to walk the rest of the way down. We were only halfway there! 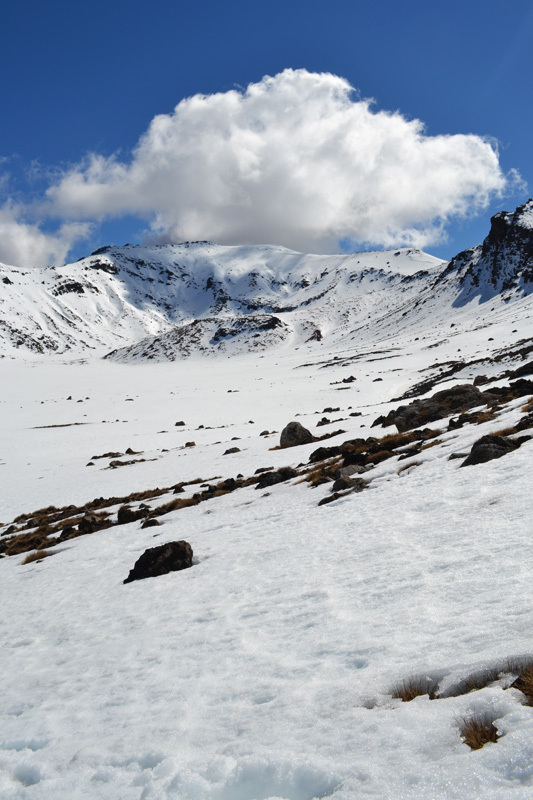 Coming off the summit, we were faced with yet ANOTHER flat snowy field of hell covering Blue Lake. Sigrid stuck by my side and we sang songs the entire way, keeping my mind off my misery. 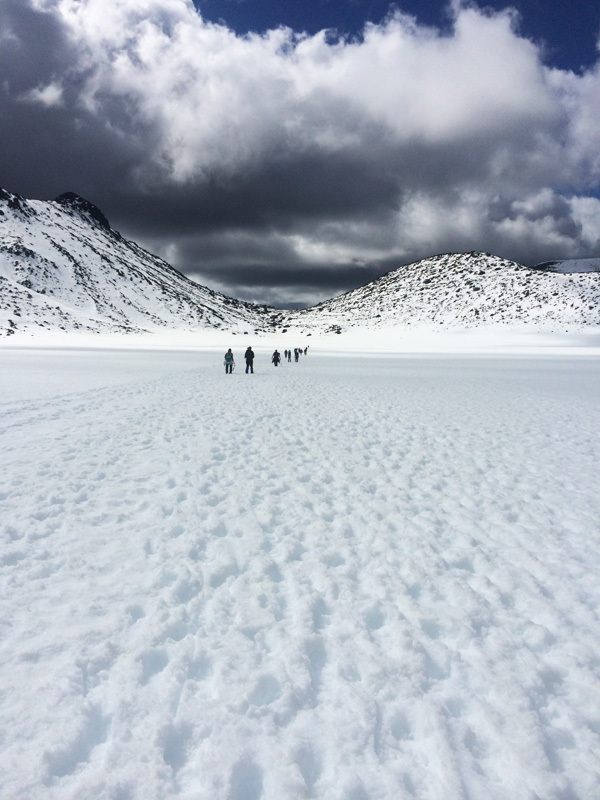 It was an exhausting trudge through the snow but we yelled out songs and marched on like soldiers, laughing in exhaustion every time I tripped over my numb feet. Thankfully it only took half an hour and by the end I was crying in relief. 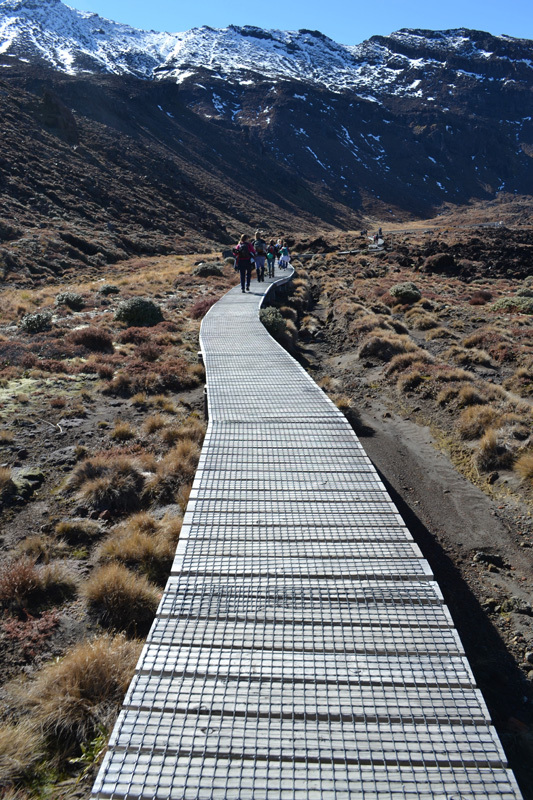 But we had one last obstacle before reaching the snow-less back-end of the trail. 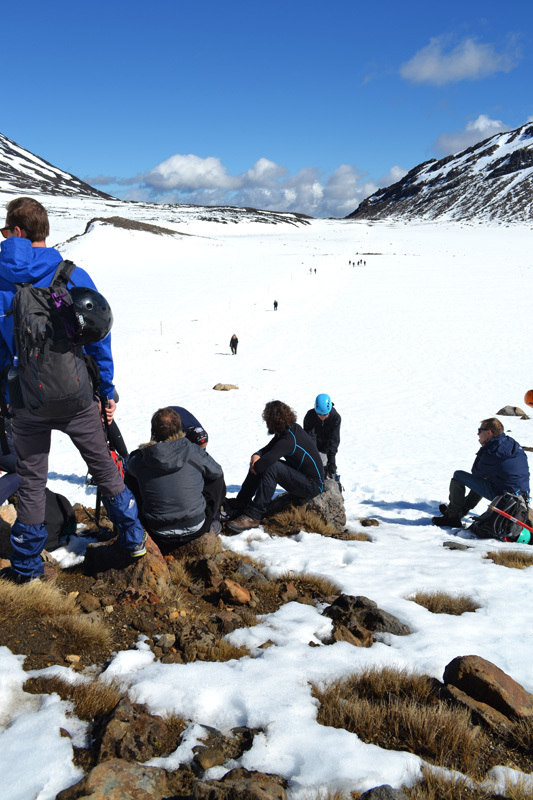 This snowy descent was so steep that the guides told us to sit and SLIDE down. Ok sure, how hard could it be? Sliding down the hard-packed snow, I screamed with glee and picked up so much speed, almost crashing into a few people along the way. Wearing only long-underwear on my bottom half, my pants were soaked through and my bum was numb in about 5 seconds. When I shakily stood up at the bottom of the hill, it looked like I had wet myself in fear! Now I had to suffer through wet pants and wet socks for the 3 hour descent. 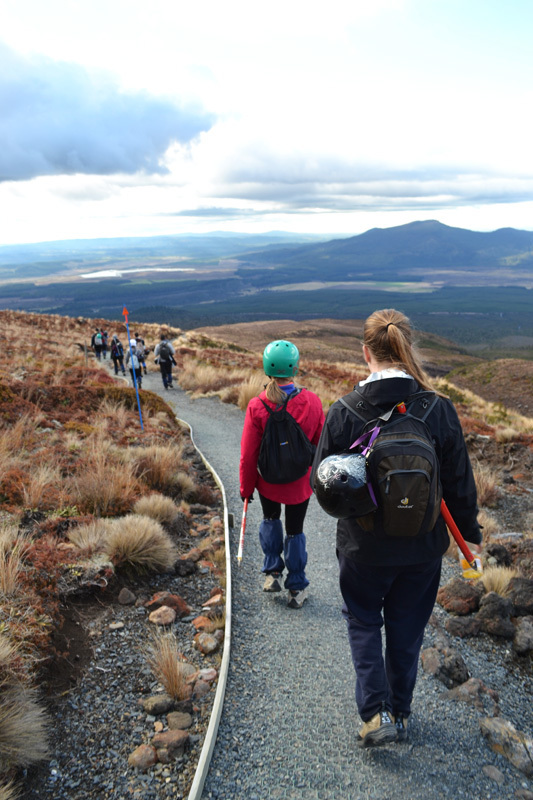 Eventually the terrain changed into a rocky saddle on the northern slopes of Tongariro with amazing views over Mount Pihanga, Lake Rotoaira and to Lake Taupo. Although my socks and pants were still soaking wet, I was so relieved to be out of the snow. 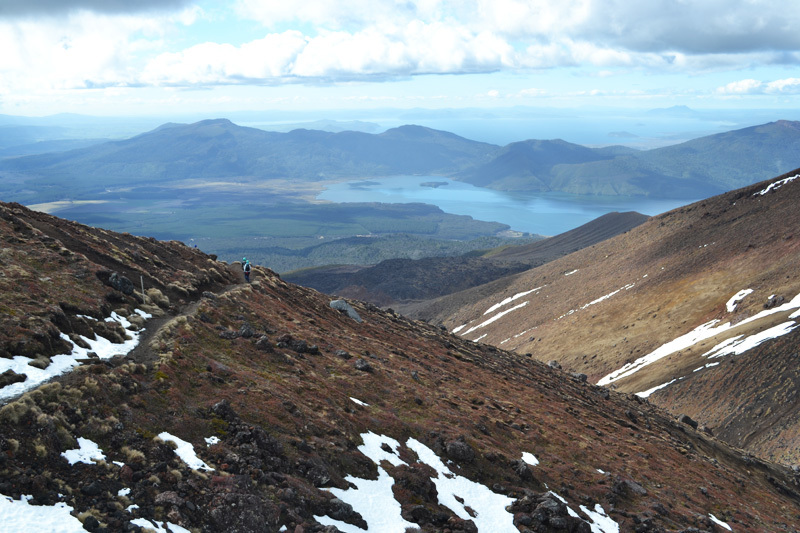 This gentle descent of switchbacks overlooking the lakes was my favorite part of the trek. I walked with a few people and swapped stories as we walked, making the time pass quickly. I shared my experiences in China which is always a good distraction. Any challenge seems minor in comparision. 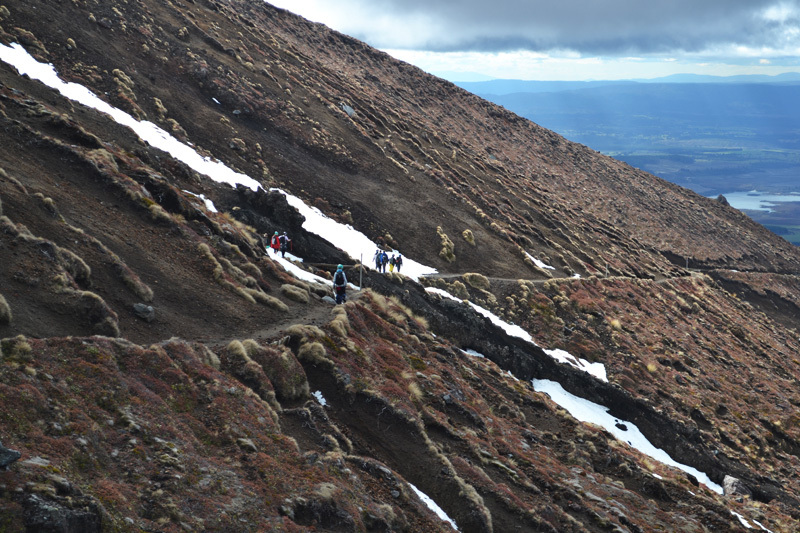 After an hour, we reached the Ketetahi Hut on the exposed face of Mount Tongariro where we regrouped for the last time before the final trek to the car park. I finally had time to take off my shoes and wring out my wet socks. My soggy feet were not feeling great. 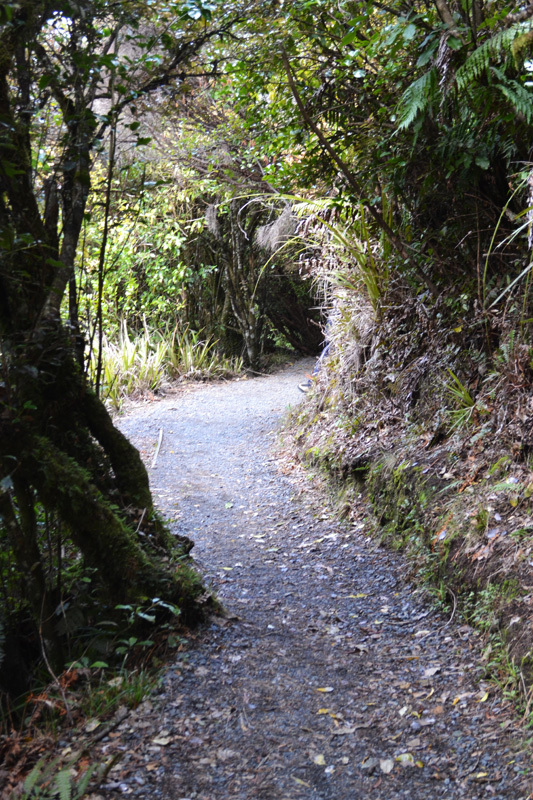 I joined Linda, Sigrid and Sam for the final section of the trail through the trees at the base of the mountain. But at the time we didn’t know that this would take 2 hours. For the last hour we blindly crashed through the forest, basically running in an attempt to get to the end already. My feet felt like they were actually going to fall off. To boost the mood, we started singing Backstreet Boys, “I Want It That Way” loudly into the forest. Hitting a crescendo at the end of the song, we rounded a corner and found our group sitting and chatting in the car park with a cooler of beers. Backstreet Boys had taken us all the way to the end! Lukewarm beer never tasted so good. 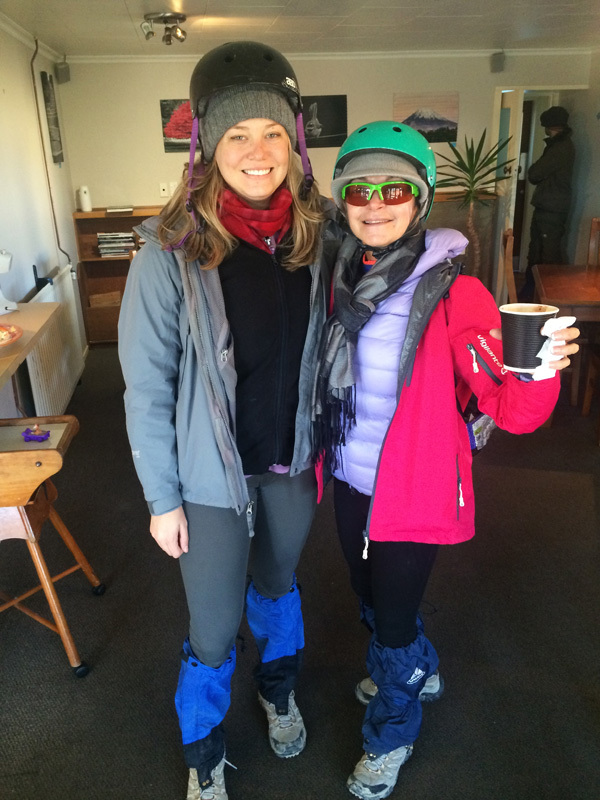 We walked 12 miles through snow and ice, helping each other every step of the way. I was loopy with accomplishment, exhaustion and alcohol. I wanted to laugh and cry at the same time. It was one of the hardest physical challenges I have ever faced in my entire life, and I was shocked that it was over. 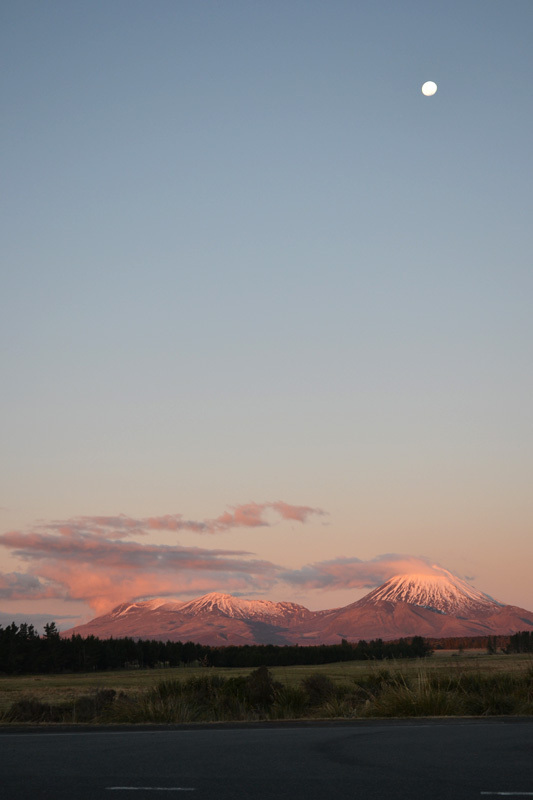 As we drove back to the gear shop, I captured the most beautiful moonrise over the mountain. The perfect ending to an amazing day. 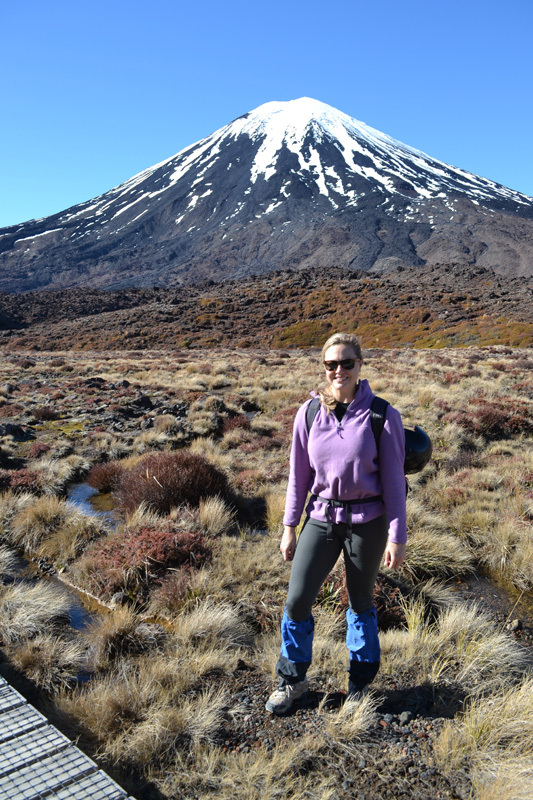 I am so proud to be able to cross New Zealand’s Tongariro Crossing off my bucket list! Just another travel accomplishment on the books. But this accomplishment is truly a testament to the amazing power of friendship formed on the road. I could not have done this without the help of my friends.